When Frank Tovey emerged at the very tail end of the 1970’s, he found himself instantly fitting into the fledgling new wave and avant-garde electronic music scene. At a time when the likes of initial line-ups of Depeche Mode and the Human League were still crafting their own forms of difficult music, before sliding towards more commercially minded endeavours, Tovey – as Fad Gadget – continued to write some wildly experimental and expressive songs in a tiny house in London, using simple tape machines and other random bits of nondescript instrumentation. 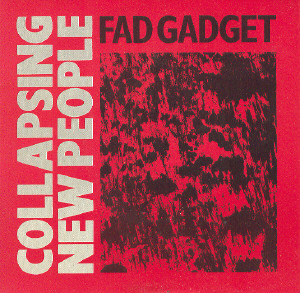 Signing to Mute at the beginning of 1980, Fad Gadget released his début album, Fireside Favourites (an Easy Music favourite…); however today’s song, “Collapsing New People” is taken from his fourth long player, Gag. Tovey was never a commercially successfully artist and one can claim that he was maybe never meant to be and Gag was proof of that. Mute essentially let Tovey do as he felt creatively and the commercial disaster that was his 1984 album scuppered any future Tovey had with the label. As many new post-punk/new wave/indie artists artists began to come to the fore at the beginning of the last decade, Fad Gadget received something of a short-lived resurgence and Tovey restarted the Fad Gadget title in order to support Depeche Mode on their Exciter tour. Sadly, the return of Fad Gadget was far briefer than anyone could have possibly imagined – on April 3rd 2002, Tovey suffered a heart attack and died at the age of 45. Below is a performance of “Collapsing New People” people from 1984 – if you were still unsure about Fad Gadget, then this video will tell you everything you need to know.